Portable Venturi Aeration System Designed following a specific request by the Environment Agency. An inexpensive, efficient venturi aeration system that can be used with any 2” (50mm) centrifugal engine-driven water pump. (Most effective with pumps of a flow rate circa 600L/min). Portable and stable - weighs 14kg. Rope carry handles and powder-coated finish on steelwork. Requires no on-site power supply. 2” pump can easily be hired, or purchased from Aquatic Services as and when required by fish farms, fishery owners and angling clubs etc. 2” venturi is just as efficient as other (much more expensive) aeration equipment. 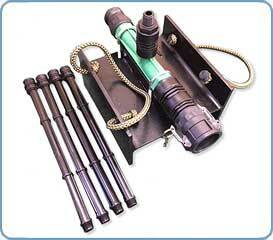 Can be deployed in virtually any body of water and virtually any depth. Can be secured on-site (chain and padlock around a suitable anchor such as a tree). Hole for chain is pre-drilled.